Look up to find forgotten clusters of vintage neon signs in the streets of Chinatown, back alleys and backstories are included. 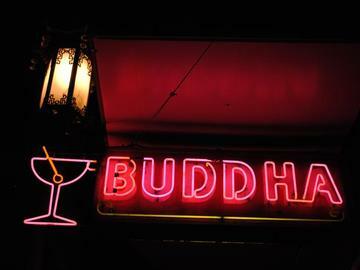 Spend an evening with San Francisco Neon authors and photographers Al Barna and Randall Ann Homan. Tours feature local history with architectural and graphic design insights to San Francisco's unique legacy of surviving neon signs. Photography and a lively Q&A are encouraged. Be prepared to walk 2 miles for approximately 1.5 hours, with rest stops. Reservations details: Please include your cell number in case of any last-minute changes due to obstructions or stormy weather. We'll email you all the details for your tour, including public transit and parking tips. Small Print: Please note that we reserve the right to change/cancel the tour due to obstructions, stormy weather, or insufficient reservations. Full refunds issued for canceled tours. All participants agree to assume 100% responsibility for their own safety, conduct, and well-being, and recognize that possible hazards exist while participating in outdoor (or any other) activities; and agree to participate solely at their own risk. If you join this group, and purchase tickets, and/or attend any Giant Orange Press events; it shall be conclusively presumed you understand and agree to this policy. There are several places in the tour that require stepping up and down curbstones to save time. Please let us know if this poses a problem and we can accomodate.